As the two orca brothers slipped quietly past us, their enormous shiny fins cut through the water like daggers. They had been weaving their way through the Strait for the past half hour and while Kaikash moved with ease and grace, his older brother Plumper was laboured in his movements. He struggled to remain at the surface and his breathing was strained and stressed. Word in the area was that Plumper was dying. Seeing such a magnificent, big, bold creature, wheeze and struggle in his watery abode moved us all. There was nothing anyone could do except keep an eye out for him and his brother and hope and pray that somehow he would come right. It was obvious from Plumper’s breathing that he was in trouble, but there was another more subtle sign that most people would never have noticed. Certain scientists, conservationists and locals knew he was starving to death, but how? Poor Plumper was suffering from a condition called ‘Peanut Head’. A healthy, well fed orca in essence doesn’t have a discernable neck. Their head runs in a smooth line to their back, giving the appearance of a streamlined, glossy surface. If this creature due to illness or lack of food begins to starve, they lose weight around their head and a groove forms in the area where a neck would be on other creatures. This shrunken head and this notch in their ‘neck’ region gives them the unusual title of ‘Peanut Head’. Some years earlier, there had been three of these brothers, or the three amigos as they were called. Plumper, Kaikash and their other brother Cracroft were an indomitable force and regularly seen together. Their mother Sophia had died in 1997 leaving the males to fend for themselves. In orca society, males stay with their mothers till death and some don’t thrive after her passing. The alliance forged between these three after Sophia’s death endured and the brothers were always seen together. They were even adopted for a time by a matriarch called Scimitar who had lost two of her own sons. Cracroft was the oldest of the three and was last seen alive in the Spring of 2010. In the Spring and Summer of 2014, numerous sightings of Kaikash and Plumper around Johnstone Strait indicated that Plumper’s health was faltering. 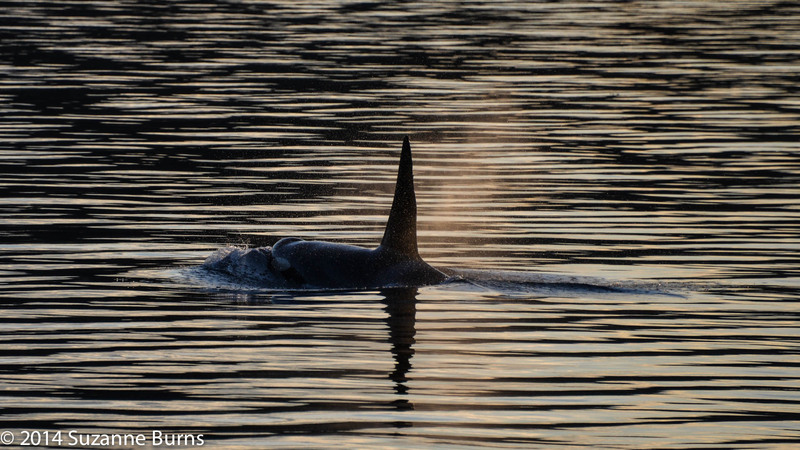 One of the last evenings out on the water for the season and Plumper was swimming ahead of us, silhouetted by the brilliant sunshine casting an ethereal glow on his back. As he exhaled, the mist that emanated from his body formed golden droplets that glittered and dazzled us. I took a photo of him in this cascade of light and this was when I first saw that mortal sign on his neck. The sun perfectly illuminated the depression beneath his head, an ominous sign of his failing health. This was the last time that I saw Plumper alive. Within a couple of weeks he was missing, presumed dead. He was never seen again. Around the same week that I had seen him, researchers from NOAA (National Oceanic and Atmospheric Administration) and Vancouver Aquarium filmed orcas using a hexacopter drone. 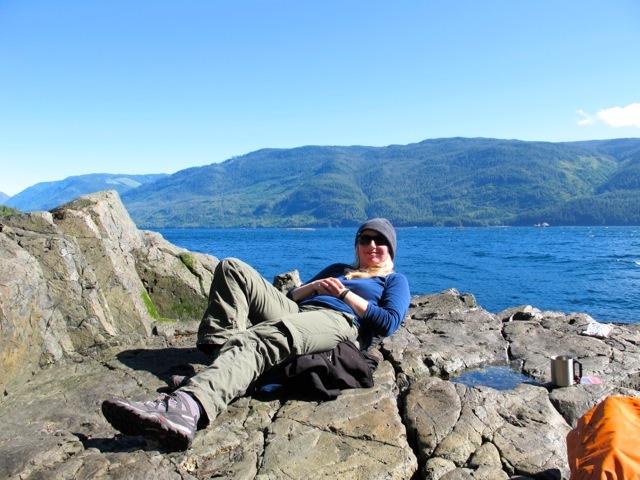 The research aimed to determine if salmon fisheries were impacting orca populations. Their pioneering research was establishing the body condition of the orcas in the area. Ascertaining the size of an orca from a boat is problematic as it is hard to see their bodies completely. However to view an orca from the sky is a different matter. The researchers were able to see clearly if certain individuals were thriving or declining. Footage of Plumper from the drone indicated that he was very skinny. They were also able to see if any females were pregnant. Armed with this vital information, the scientists were able to foresee population growth and decline and pinpoint problematic areas. If an orca is starving, this can potentially illustrate an issue with declining fish stocks. With knock on effects of fish declines affecting orcas, new legislation and protective measures can be brought in to help these creatures. Lovely piece, Suzanne. I am sad for poor Plumper. Thanks Niamh. Ya me too, it was tough seeing him struggle. I learnt so much there that I never imagined I could. Hope you are well :).